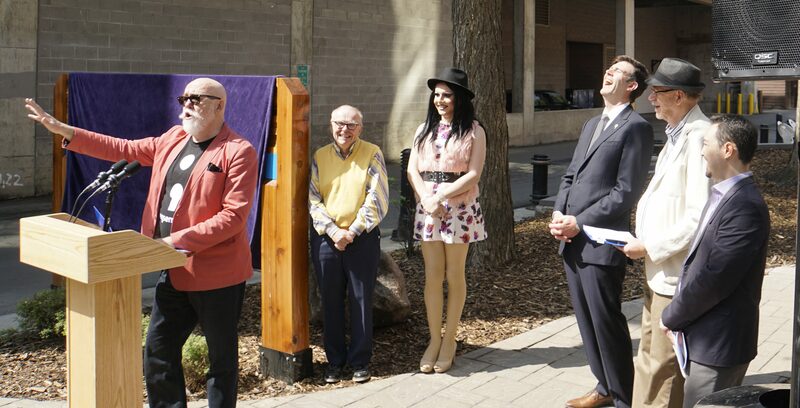 A new park in downtown Edmonton has been named “Michael Phair Park” after the former city councillor and active community champion. Sharing space with a still active lane way, it is an open and functional space which will serve local communities well. You might, however, be tempted to ask why such a humble piece of green-space is attracting such notoriety. Why does this small park matter? Today’s downtown is growing rapidly and is characterized by new development, new communities and a new cosmopolitan ambition. At the forefront of that renaissance has been the emergence of 104 Street as an essential (although still fragile) focal point for imagining a vibrant and youthful prairie-urban city. Anchoring the street to Jasper Avenue and involving an alley conversion, the park has been a prompt and challenge for thinking about downtown planning differently in Edmonton. It is a space which itself isn’t a destination but an invitation to move through, use and define the city. Its purpose is one of openness and inclusion, bringing communities together. It reminds us that human scale development is essential to cities, not simply an idea to be talked about, but a realizable aspect of urban social life in a downtown currently dominated by large corporate projects. And, for all these reasons it is unfinished. There is an alley on the other side of 104 Street that could be made into something much better. There are also many other small spaces (alley ways, surface lots, sidewalks, and so on) that can be rediscovered, re-imagined or re-purposed as essential public-urban spaces for growing our community. When we get there that will be a tremendous legacy.